Cecilia Fryxell was a key figure within the Swedish pedagogical movement that supported educational opportunities for girls. Cecilia Fryxell was born in Vassända parish near Vänersborg in 1806. When she was eight years old her father had to give up his position as sheriff and this led to the family being broken up. Cecilia Fryxell and her brother ended up living with relatives whilst her two younger sisters carried on living with their parents. At the age of 18 Cecilia Fryxell moved to the Svaneholm works estate in order to earn her own living. Subsequently, until 1844, she worked as a governess or as a companion on various estates. She earned a good reputation during this period and was described as both intellectually and musically talented, as well as reliable. She was active in dance, theatre, and spiritual issues both professionally and in her private life. As the years passed she became increasingly interested in spiritual matters and eventually she decided to give up working as a governess in order to become a missionary. Cecilia Fryxell’s intention was to begin her missionary work in northern Sweden and then to make her way to India, America and to Egypt. Following an exchange of letters with Peter Fjellstedt, a missionary priest, she decided to apply first to the mission institute in Basel and duly travelled there in the spring of 1845. Whilst undertaking her studies she began to teach, initially in Basel, and subsequently at Christian Heinrich Zeller’s school in Beuggen, south Baden. As her missionary studies came to an end and her practical period was completed, she was determined to be in far too poor health for missionary work. She therefore continued her studies and focused on studying teaching methods and organisation in various schools throughout Germany and Switzerland, before she finally returned to Sweden. 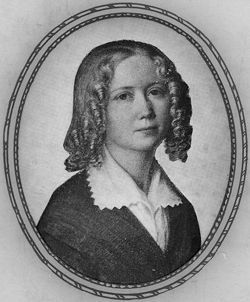 In 1847 Cecilia Fryxell was appointed as teacher at the Brödraförsamling school in Gothenburg. Shortly thereafter she decided to set up her own school in Helsingborg. Her plan was to establish a boarding home for just shy of a dozen girls, but initially she had difficulty in filling her vacancies. Despite this setback she successfully opened her girls’ boarding school, mainly by involving influential people such as the Countess Ewa Lewenhaupt in the enterprise. After a couple of years the school – which at that time had both half-board and full-board places – had expanded to comprise more than 100 students. Cecilia Fryxell was able to bring competent and dedicated members of staff on board and the corps of teachers at the school included, in addition to Cecilia Fryxell, Peter Wieselgren and Sophia Posse. Peter Wieselgren was at this point a successful educational and temperance promoter and Sophia Posse had studied school-teaching abroad and gained thorough teaching experience in Stockholm. In 1852 Cecilia Fryxell and Gösta Lewenhaupt, who owned the Karlslund estate near Västerås, came to an agreement that the school should be moved to that estate. During the 1850s Cecilia Fryxell established one of the first female teacher-training programmes there, in an enterprise that was tied to the girls’ school. Several of the students on the training programme, such as  (Sigrid Rudebeck) and Lina Husberg, would subsequently set up their own girls’ schools. The former founded the Sigrid Rudebeck elementary school for girls in Gothenburg and Lisa Husberg established the girls’ school in Enköping which served as the basis for Enköping elementary school for girls. Thus Cecilia Fryxell’s teaching methods and principles became spread across the country. The Karlslund school grew rapidly and after six years Cecilia Fryxell wanted to open up yet another girls’ school in Kalmar. With the help of friends she was able to buy a property at Rostad where she opened her school in 1859. Student places at Rostad became popular very quickly and were booked several years in advance. The school comprised three classes and one teacher-training class. Just as had happened at Karlslund, several of the Rostad students went on to found their own schools once they had completed their education at Rostad. Cecilia Fryxell ran the Rostad school until 1877, at which point her plan to have the boarding school converted into a folkskoleseminarium (public school training programme) was realised. At that point she donated both the school and the property to the state. The teaching at Cecilia Fryxell’s schools was typically broadly spiritual, partly in the form of religious education, and partly through specific time set aside for students’ contemplation and reading. The students were expected to participate in the everyday work at the school, such as setting tables and other tasks. Further, there were daily rotas of physical activity in the form of teacher-led walks which were combined with suitable teaching. Cecilia Fryxell emphasised the role of the teacher as figurehead and promoted stable behaviour in the classroom. Cecila Fryxell believed that through a teacher’s extensive preparation, determination, and intellectual vibrancy the best conditions were created for to provide proper education. Cecilia Fryxell died in Kalmar in 1883. Her grave lies at the Södra cemetery in the same town. Ulrika Cecilia Fryxell, www.skbl.se/sv/artikel/CeciliaFryxell, Svenskt kvinnobiografiskt lexikon (article by Madeleine Michaëlsson), retrieved 2019-04-24.